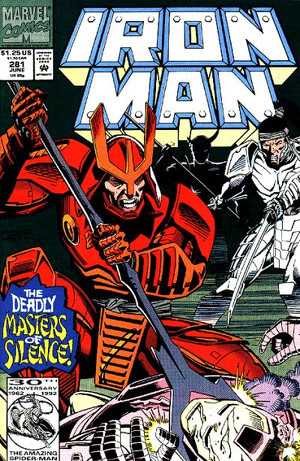 The Masters of Silence are coming to pay Tony Stark a visit and he needs something to wear. Luckilly Stark's got just the black and white suit the occasion dictates, just too bad for the Masters it's not one that fits in a coffin. Proving if smoking is hazardous to your health, being Iron Man has to be beyond fatal, years of various armours and exoskeleton suits have wrecked Tony's body at the cost of saving the world. Talk about pick your jaw up off the floor moments. Despite being on the cover of Iron Man #282, as a long-time reader I never thought the book would end with Tony - Marvel's shiny red and gold Avenger himself - inside that suit, let-alone on such an awesome final page. 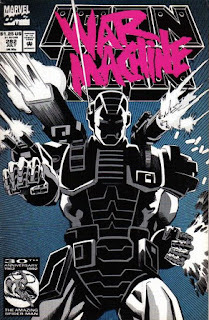 Us Iron-fans were used to defending why we brought Iron Man in these pre-internet spoiler days instead of Punisher. Then in a blindside move by Marvel, Tony went and got an arsenal all of his own that made Frank look like a bit of a blouse. The classic Iron Man logo polishing up the dawn of a new era was a nice touch too. 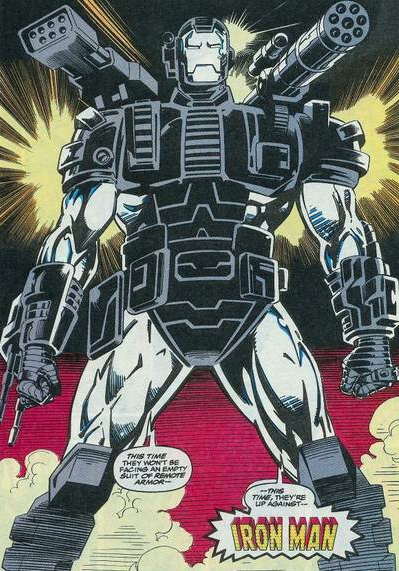 While the suit that debuted here went on to be worn by Tony's long time best mate James Rhodes as War Machine, you can see how Tony originally feared behind the wheel, against the Masters of Silence (where are they now? ), by picking up Iron Man vol1 #280-282 from your favourite comic supplier. Dan - Nice write-up! I'm glad I'm not the only one that enjoyed that run! So many people dismiss all 90s superhero comics because of the stigma that era carries. That may be true for some comics, but others stand out as good stuff. This was one of them.